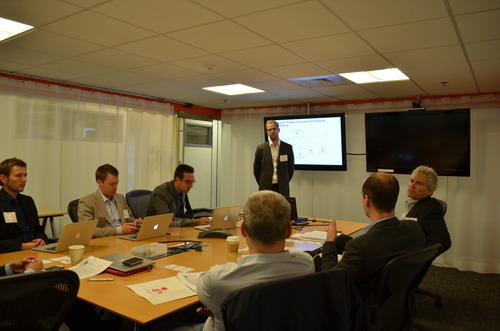 swissnex Boston was excited to host the Swiss National Startup Team for the 14th time in Boston this past June. Since 2000, swissnex Boston and Venturelab have jointly organized “Venture Leaders”, a 10-day business development ‘boot camp’ held annually with a selection of the 20 brightest entrepreneurs from Switzerland. This year, for the first time, the program also extended to New York City, where swissnex Boston has had an outpost since 2013. The Swiss National Startup Team had the opportunity to dive into the entrepreneurial ecosystem and get a grasp of the business spirit within both cities. This year’s team consisted of a large array of high-tech startups with activities ranging from recovering paraplegic patients’ locomotion to an insect-inspired micro-drone. The profiles of the individual venture leaders can be found here. The intense program included business trainings at Babson College, company visits, coaching sessions and workshops with successful local entrepreneurs and investors, as well as pitch competitions and networking events. This unique experience provided the venture leaders not only with team-bonding, but a new perspective with a ‘think big’ attitude. In the following sections, we feature some of the activities that the Venture Leaders participated in during their stay in the US. The venture leaders benefitted from a three-day intensive program at Babson College, one of the highest ranked business schools in the world, specializing in management and entrepreneurship. The team attended classes led by Prof. Les Charm and Prof. Ed Marram on team building, decision-making processes, strategy, and leadership. The 20 entrepreneurs had the opportunity to pitch their businesses in front of industry experts from various sectors. These sessions provided the entrepreneurs with valuable feedback for refining their business plans. The sessions took place at the Cambridge Innovation Center (CIC), a startup incubator hosting more than 600 startups. CIC is considered the ‘Mecca’ of startups in Boston, where many large corporations decide to have a presence and access to a strong pool of resources for innovation. The cross-pollination between the different groups here is successful and generates many business opportunities for foreign startups cropping up in the US. 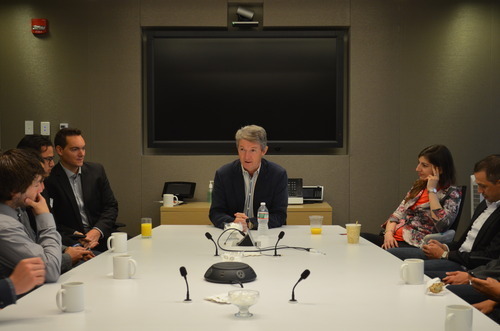 The venture leaders had the opportunity to visit several major venture capital funds and meet with experienced investors in both Boston and New York. Their businesses were challenged in terms of disruptiveness towards the current industry trends. In addition to receiving incredible exposure through this exercise, the venture leaders could also being to understand what are the present ‘sweet spots’ of Venture Capital investments, and with this insight refine their pitches respectively. The group visited Third Rock Ventures (current lead investors in revolutionizing biotech companies such as Editas), General Catalysts (host of Kayak in the early days) and Highland Capital Partners (investors in paper.li and Vista print) in Boston, while in New York they visited New Leaf Ventures and Beta works (where bit.ly was founded). Bob Davis, General Partner at Highland Capital Partners challenging the Swiss National Startup Team. Parexel (Boston) is one of the world’s largest CROs serving the biopharmaceutical and medical industry. Operating in 50 countries around the world with 15,335 employees, this was one of the highlight visits of the program in Boston. Mr. von Rickenbach, Chairman and CEO of Parexel, gave an inspiring speech sharing his experience as an entrepreneur – the sacrifices, the challenges, the rewards and the troubles he endured. During his career, he was able to take Parexel from its beginnings as one of the first clinical research organizations (CROs) in the early 1980s to its current position as one of the top three public biopharmaceutical service providers. He has led Parexel through its IPO, multiple public offerings, and over 35 mergers and acquisitions during the company’s three decade history, expanding its portfolio to meet changing client needs and market demand. Under his leadership, Parexel has evolved to provide a broad range of services, including globally integrated clinical development, regulatory affairs consulting, commercialization services, and technologies that expedite time-to-market. In addition to the inspiring speech given by Mr. von Rickenbach, the venture leaders received insights in regulatory and corporate partnership strategies. The program in NYC was quite packed and included a variety of visits and fruitful discussions with successful entrepreneurs having started startup ventures. These visits included among them Tumblr, reddit, Zkipster, Art Sy, and Chromocell. swissnex Boston organized a series of events around the venture leaders program. The landmark event in Boston was the Global Pitchfest 2014, which took place at Boston’s District Hall. This pitch competition was organized jointly with MassChallenge, the world’s largest startup accelerator. The pitch competition consisted of Swiss entrepreneurs competing alongside local entrepreneurs for the best pitch. Each startup had to convince both the live audience and a panel of Swiss and American startup experts that their business was the best venture to invest in. The rules were simple: one minute and one slide per pitch. The audience could vote in real time through an SMS-based polling system, while the jury made the selection based on a number of criteria. This year, the audience and the jury were unanimous in their selection of a winner: One Drop Diagnostics, an EPFL spinoff that developed a mobile medical diagnostics device that can provide laboratory quality diagnostics in a more mobile fashion, either at the doctor’s office or the patient’s home. The Pitchfest winner and the participating audience also had the opportunity to win various prizes awarded by raffle, and generously sponsored by Swiss International Airlines, Victorinox and Lindt. 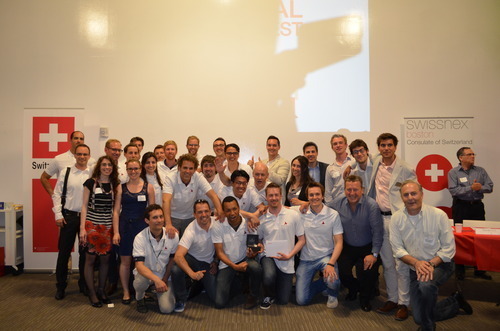 The Swiss National Startup Team at the 2014 Global Pitchfest. In New York, the venture leaders had the opportunity to partake in another pitch competition: the Swiss Tech Night, which took place at WeWork and was co-organized withVentureOutNY. 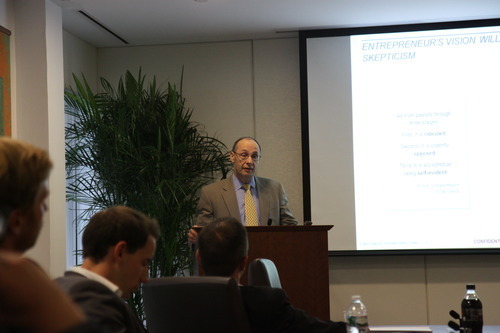 The New York audience and jury chose another winner, Versantis, an ETH Zurich spinoff developing versatile antidotes, capable of removing diverse toxic agents from the organism and saving patients from metabolic, medicine and drug overdoses. In New York, The venture leaders joined the Swiss Business Hub USA and Switzerland Global Enterprise to celebrate the 10th Annual Tell Awards, which recognize U.S. companies with significant investment projects in Switzerland. Recipients this year included Google, MSA Safety and Novocure. The awards, named for the legendary Swiss hero William Tell, were presented on June 19 by Ambassador François Barras, Consul General of Switzerland in New York and Daniel Küng, CEO of Switzerland Global Enterprise. Bloomberg hosted the event at its New York headquarters. Following the Awards Ceremony, the Swiss National Startup Team was invited onstage to showcase Swiss innovation projects.